I was having a conversation with a former student of mine very recently (you know who you are!) 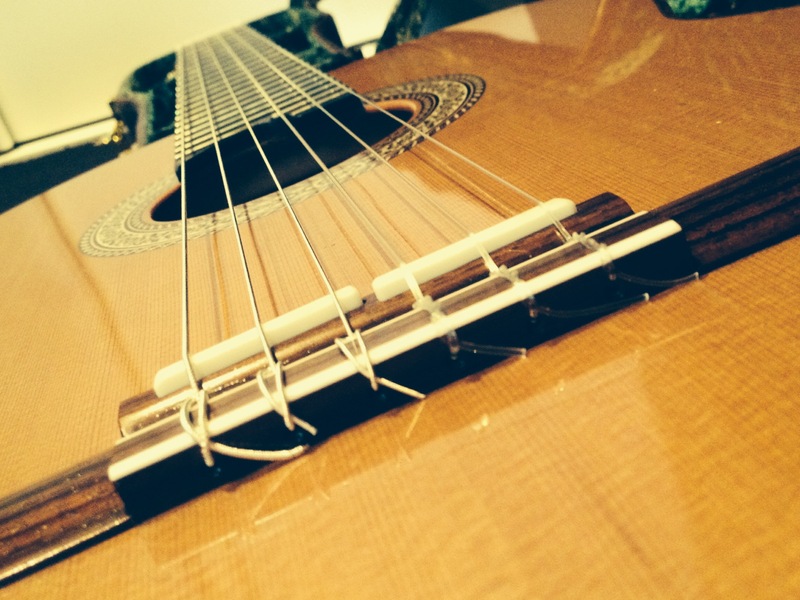 about the need to trust and believe in oneself when playing classical guitar. It’s a thought that I’ve held true for some time now, but admittedly can be a pretty tough one to manage. Like a number of things, however, it’s a skill or an ability that doesn’t necessarily come easy at first, but the more that you practice doing it the less challenging it becomes. What’s so important about trusting yourself when playing? Trusting yourself is allowing yourself to make the music that you want to make (within your current technical abilities of course) and that that is that (whatever your level or technical ability is). Just is. Things can always be improved, tweaked and so on. It doesn’t mean that what you’re playing right now isn’t wonderful. Accepting this fact, and accepting that what you’re playing right now and how you’re playing it – trusting yourself in that – is just a snapshot in time in your journey with the guitar . This concept, for myself at least, has been quite liberating. Giving myself permission to trust myself! How do you go about learning to trust yourself? This is really about letting go of expectations. Not expecting yourself to play in a certain way. Not putting pressure on yourself. It’s about recognising that you’ve done a lot of work – think about all the practice you’ve done over the years, months, weeks and so on. It’s about trusting that subconscious part of your brain, the part that you’ve been filing things away into and reinforcing with your regular, habitual practice. It’s about trusting that that part of the brain knows how to do its thing, especially when you’re relaxed and not putting undue stress on it. You know how when you’re racking your brain to try and think of a name or something you can’t remember? It’s just on the tip of your tongue? The more and more you try and think about it, the harder it becomes to think about it? Well, I’m guessing something similar goes on when we’re putting stress on ourselves to play in a certain way. Don’t try so hard, don’t think so much and the brain and the body will help you do your thing. Trust that your muscle memory and all that hard work and practice you’ve been putting in will work for you. Be “in the now” with what you’re playing in exactly that one moment – don’t worry about what you’ve just played or what’s coming up next. Just focus on the moment. Now the technical elements of your exam should most definitely not be overlooked nor underestimated. The technical exercises, including the various scales and arpeggios, relevant to your particular grade, should not be underestimated both in terms of the weighting placed on them in the exam and also, importantly, how vital this kind of work is to your development as a guitarist overall. So one cannot really get by just giving these elements a rudimentary look over. Firstly, talking purely from a “passing the exam” point of view, the security and confidence required to execute your technical work to the satisfaction of the examiner will most definitely require more than a quick look over or a secondary consideration to your repertoire pieces. If you flunk the technical work part of the exam, let me tell things won’t look too good for your overall score! By looking into the technical elements a few weeks before your exam, or just by looking at them once or twice a week, it’s unlikely you’ll develop the required level of execution to satisfy the examiner. Technical exercises require time and consistent, highly regular practice. This also requires patience and perseverance on behalf of yourself as the student, as you’ll need to maintain your consistent practice over a long period of time – perhaps the space of 12 months or even 24 months from one grade to the next. Gosh, that makes it sound so tedious doesn’t it?! Don’t forget you’re a musician and you’re doing this to help your development as a musician – so play your technical exercises in a musical way! Do you find them boring? Well, you’re the one playing them, so there’s only one way to make them less boring – play them less boringly!! Have fun with them!! The examiner will thank you too, I’m sure, for making them sound like you enjoy them in the exam room too. Remember, they’ve heard countless examples of what you’re about to play them – give them something beautiful! Once you know you want to sit for a particular grade exam (or even before if you have half an inkling that you might), I highly recommend you get stuck into the technical work as one of the first things you do. And work on your technical elements daily – you don’t have to drive yourself loopy with it; a little and often is what will see you progress. Depending on what grade you’re aiming to take will dictate how much time you need to spend just in terms of volume of material to get through, but 10-15mins every day is so much better time spent than 30 mins twice a week. You don’t have to do everything on the list every day either, you could write yourself a little schedule of technical work practice to ensure that you’re covering everything off in the space of a week. It’s possible then to see more clearly what may need more work more frequently, and what could be scheduled in less frequently as you progress through the weeks. It may also be the case, depending on whether the exam you intend on taking is following on from the previous grade exam, or you’ve not taken an exam for a while, or this is your first grade exam (whatever level you’re entering in at), that you need to build up to the technical requirements of the grade you’d like to sit for by preparing with some exercises from lower grades or some supplementary material. Secondly, and now talking from a general technical development point of view (which applies equally to those not sitting for exams), I can’t stress enough the importance of technical work. Yes, you may find yourself getting by and playing pieces of reasonable difficulty. There will come a time, however, when you will hit a brick wall in your playing and your progress will become limited. One of the beauties of sitting for a grade exam on the classical guitar is that it forces you somewhat to address the technical work head on – there ain’t no getting around it! The consistent and concerted study of technique on the guitar, I promise you, will make your guitar-playing life a whole lot easier. The study of scales, arpeggios, and left and right hand exercises of varying types will facilitate ease of playing on the guitar so the execution becomes less of a consideration than the music itself. Technical work is not an end in itself, it’s all there to help you make the most beautiful sound and create the most expressive music possible with the least effort (particularly when the pressure may be on in a situation such as an exam).